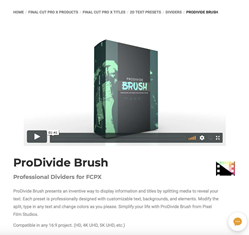 Developers at Pixel Film Studios Create and Captivate with ProDivide Brush for Final Cut Pro X.
Pixel Film Studios, leading developer of visual effect tools for the post-production and broadcast markets, announces the availability of ProDivide Brush enabling film editors to incorporate stylized brush dividers to Final Cut Pro X projects. "ProDivide Brush adds sleek and stylish brush designs to professional dividers to create spectacular scenes within Final Cut Pro X!" ProDivide Brush presents an inventive way to display information and titles by splitting media to reveal text. Each preset is professionally designed with customizable text, backgrounds, and elements. Modify the split, type in any text and change colors effortlessly. Simplify life with ProDivide Brush from Pixel Film Studios. ProDivide Brush features 30 divider titles designed for Final Cut Pro X. This makes sure users have lots of variety when displaying info titles. Plus, each ProDivide Brush preset is totally customizable and adaptable to any project. ProDivide provides users with a great way to introduce a subject using info titles. Just use the Main Title and Subtitle text to write in custom text. Introduce people, places, and ideas with ease in Final Cut Pro. ProDivide Brush features a unique way of displaying titles and information. ProDivide works by creating a split in media revealing underlying text. The split can be offset horizontally, scaled in or out, and angled to add more excitement.